There are several business models that have emerged in the world of cloud. An organization that has the assets, financial backing and skills may choose to build their own cloud, becoming operators as well as sellers of their core product or service. An organization may also opt to partner with a proven cloud provider and have their customers work directly with that approved cloud provider of choice. Yet, perhaps the fastest-growing model in the cloud services industry is that of ‘white-label’ partnerships. These partnerships represent a great opportunity for organizations looking to evolve and keep up the pace with the ever changing IT landscape – or for organizations with a traditional ‘onsite’ focus. As customers move their own cloud journey forward, so must their partners. 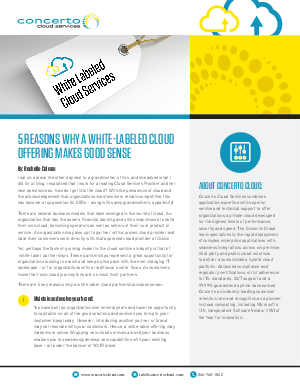 Download this whitepaper to learn 5 reasons why a white-labeled cloud partnership makes sense.